We are pleased at Friendship Springs Veterinary Care to be able to offer some new avenues of treatment for pets, namely acupuncture and herbal medicine. 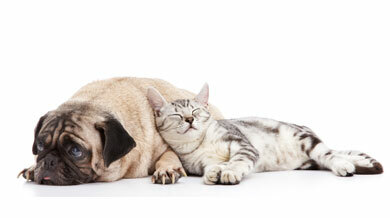 These are two of the key components of what is called Traditional Chinese Veterinary Medicine (TCVM). Traditional Chinese Veterinary Medicine has been around for a very long time, thousands of years in fact. What we have learned much more recently is that the integration of TCVM with Western veterinary medicine (WVM) often results in better responses by patients than occurs either one alone. Both TCVM and WVM have strengths and both have weaknesses. We have learned that WVM often works best in acute diseases or in the acute phases of disease, such as infections, trauma,exposure to toxins, and so on. One of the weaknesses of WVM is side effect issues of medications. TCVM, on the other hand, often works wellin chronic disease states through acupuncture, herbal medications, and dietary manipulation. However, its down side is that it does not involve specific identification of the disease process such as can be identified by Western technologies. By integrating Western diagnostic capabilities with the greatly lowered side effect issues of Eastern medicine we can bring the best of both worlds together. Acupuncture is a very ancient art of placing very tiny needles into key points of the body called acupoints. These acupoints are usually found on “meridians” which are the invisible channels through which Qi (pronounced 'chee') or energy flows. In more practical terms (and less seemingly like voodoo-type medicine)acupuncture has been proven to stimulate different systems in the body through endorphins, serotonins, and other neurohormonal mechanisms.These effects are far-reaching and can help with pain and analgesia,immune system functions, inflammatory conditions, and other biochemical workings. Interestingly, while many people are at least passingly familiar with the benefits of acupuncture for pain relief, many are unaware that acupuncture has been shown to be beneficial in helping with many internal medicine diseases, including such diseases as cancer. Because of the small size and diameter of the needles involved in acupuncture, there is very little pain involved most of the time, and many pets tolerate and even enjoy acupuncture. Sometimes they even fall asleep during the procedure. For the ones who do not tolerate it quite so well, there still may be other ways that acupuncture can be made to work for them. Herbals have drug-like properties and should only be prescribed by a veterinarian trained in Chinese herbs. They can be used alone, or in combination with conventional medication. They are often used to complement acupuncture. Many TCVM practitioners believe that herbals are as important, or even more important, as acupuncture.Because the arena of herbals is largely unregulated with only limited FDA oversight, quality control, transparency, honesty and trust are essential. We will only use, recommend, or prescribe Dr. Xie's Jing Tang Herbal, Inc. products. Dr. Huisheng Xie, DVM, PhD is the founder and president of the Chi Institute which is a world leader in training veterinarians, including Dr. Cutchin, in the art of Traditional Chinese Veterinary Medicine. Jing Tang Herbal is on the campus of the Chi Institute so it is right under his watchful eye were he can over see directly production and distribution of the herbals. While we get our acupuncture program offering up and running Dr. Cutchin will be available on Thursday mornings between 8 and 11 am for Appointments. As we are able we will provide additional times and days.